When it comes to the kitchen, space can be the biggest commodity, with the kitchen home to not only plenty of essential appliances, but is often a hive of activity, whether it’s the kids running riot looking for snacks, or having a few guests over for Sunday night dinner. As a result, the size and dimensions of your appliances can be a big factor when it comes to fitting out your kitchen. An oven is often one appliance that households can’t operate without, with the idea of Sunday roasts, frozen pizza and baked goods enough to set anyone’s mouth watering, but can sometimes be a tad too large for some kitchens. But before you stress about going without some foods, plenty of brands offer toaster ovens – a smaller, portable option available at a fraction of the cost. But before you run out and pick one up, read on to find out just what these brands have to offer in this Canstar Blue article. A popular brand for all things kitchen appliance-related, the word ‘Breville’ is a common sight in many Australian households. While more expensive in comparison to many other brands, Breville’s range is also slightly more extensive than other brands, meaning you may find the toaster oven you’re looking for. The Smart Oven Pro, Breville’s flagship model, comes equipped with Element IQ, which controls multiple heating elements to move heat where it’s needed most, either above or below food to suit whatever you’re cooking. With pre-set cooking functions for toast, bake, roast, grill, pizza, warm and slow cook, you’ll still be able to create all types of meals. Breville also offers the Compact Smart Oven for those with limited space, with all the same features packed into a smaller model. Additionally, if you’re keen on your pizza (and let’s be honest, who isn’t? ), Breville also offers the Crispy Crust Pizza Oven, a portable option that can cook a whole pizza to your preference in minutes. Made of stainless steel and natural ceramic, the Crispy Crust features a viewing window so that you can keep an eye on your dinner, as well as multiple settings for your crust preferences, in addition to a reheating option for leftovers. Another giant of the kitchen appliance scene, Russell Hobbs offers plenty of variety when it comes to toaster ovens, potentially making it an ideal brand regardless of how big your household is. 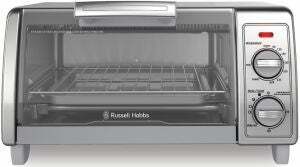 Starting with the Bake Expert Mini, Russell Hobbs offers a model that contains four cooking programs to grill, roast, toast and bake all types of food. It also includes a Keep Warm function for when you plan on eating later, in addition to a convection-styled airflow for a more even cook throughout. A removable crumb tray, wire rack and coated bake pan is also included in the purchase. For larger households, Russell Hobbs offers the Performance Digital model, which includes 12 pre-set functions for all types of food, as well as infrared wave to cook directly onto your food, saving you from pre-heating and cutting down on cooking time. With a 25L capacity and digital display, a turbo feature is also included to power through any frozen food, in addition to adjustable rack heights for larger meals, making it a perfect addition to the family home. If you usually find yourself stretched for time, Russell Hobbs offers the 5 Minute Pizza and Snack Oven, which cooks some of your favourite foods in record time through a dual quartz heating element. It has multiple functions to suit your pizza preferences, as well as a viewing window to ensure that your pizza doesn’t get burnt. Additionally, the model also comes with a portable handle so that you can easily grab your food, with the unit covered in a stainless steel finish to fit in with your kitchen’s aesthetic. 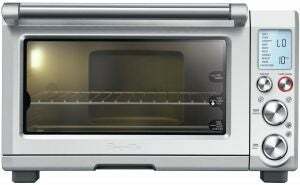 A popular brand for kitchens, Sunbeam offers a number of toaster and benchtop ovens for cramped households. Sunbeam toaster ovens are competitively priced, with options for those on a budget, as well as models for those who don’t mind shelling out a bit more. Sunbeam’s cheapest option – the 9L Mini Bake & Grill – may not offer much in terms of capacity, but makes up for it in portability and space-saving capabilities, making it ideal for those with a small kitchen, or those that don’t often cook big meals. In addition to a digital display, the Mini Bake & Grill has a range of cooking settings, including reheat, grill, bake, crumpet and toast. Retailing at just over $50, it may be the option for you if you’re strapped for funds as well as kitchen space. If you’re after something a bit bigger, the BT5350 model has a capacity of 19L, which allows households to cook roasts and pizzas for dinner. Sunbeam also include a variety of accessories, including a pizza tray, crumb tray and reversible wire rack, helping you cook whatever you’re craving. Retailing close to $100, the extra price may be well worth it with the increase in cooking possibilities. If you’re always in a rush to cook or bake, Sunbeam’s Quick Start model may be the option for you, with ten quick start functions and cooking styles available to help you cook pizzas, roasts as well as delicious snacks such as muffins and cookies. With a 22L capacity and LCD screen, Sunbeam also include a number of trays to help you with all your culinary needs. 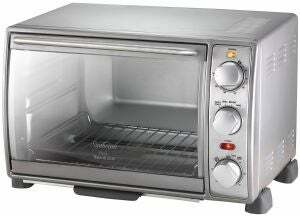 Which toaster oven should I buy? A potential savior for those with small kitchens and small budgets everywhere, the toaster oven offers the comforts of oven-cooked food with the benefits of portability, making it a handy kitchen appliance for many households. But with plenty of options available on the market, consumers might struggle to narrow down which one would be the best fit in their kitchen. While not necessarily an expensive purchase, doing your research before wandering into your local appliance retailer could save you a few dollars down the line, as well as ensure that you’re picking the best one for your cooking habits.